This article is about "How to apply permanent family visa application online in Saudi Arabia through Ministry Of Interior (MOI) Family Visa Service application". 1. Before applying for permanent family visa online, Make sure your basic salary is above SR 4000/-. You should pay Permanent family visa fee SADAD payment (SR 2000/- per family) through your Internet banking or through your ATM card. 2. Once you deposited the permanent family visa fee, You can login to your MOI Abshir account and go to above "E-SERVICES" tab, Then click on "ISTIQDAM" from left menu and select "FAMILY VISA SERVICE". 3. A new page with instructions for family visa service will appear, Read all instructions carefully and proceed with below button "NEW FAMILY VISA APPLICATION". 4. New family visa application will redirect you to a page where you can see your information like Name, Iqama details, Passport details, Religion, Mobile Number, Profession including your sponsor details. 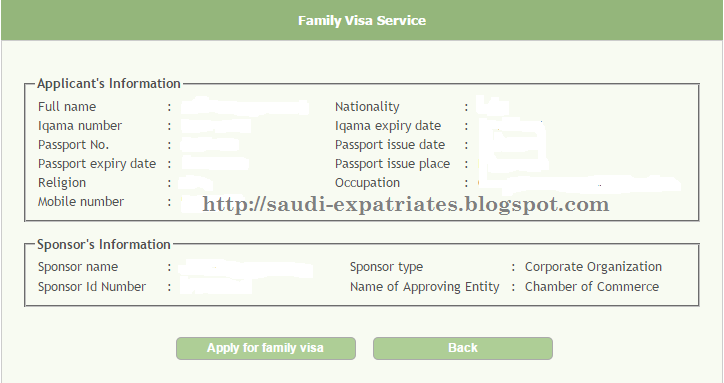 Once you check all you can click on below button "APPLY FOR FAMILLY VISA". 5. If you already paid family visa fee, Then application will let you proceed to enter details of your Salary, Level of Education, Date of Receiving Higher Level of Education, Major Subjects Studied. Now you can add your Dependents or family members with their details like, Full Name (As in Passport), Nationality, Passport Number, Age, Religion, Relationship, Port of Boarding (City where visa will stamp). 6. Agree the terms and conditions by checking the box below and the click on "SUBMIT FAMILY VISA". 1. On successful submission, Take a Printout of the application and get signed and stamped from Employer and approved by Chamber Of Commerce (COC) or Confirmed by Employer through Ministry Of Interior (MOI) Electronic portal as applicable and instructed in the confirmation message. 2. The Applicant should finish all formalities within 30 days from the date of submission, Else application will expire, In case of application expired, Applicant should submit new application again. 3. Once you get approval from Istiqdam, You will receive SMS with Visa information. 4. Once you get approved SMS, login to your MOI account and print the application from there and send it to your family members for processing stamping. I applied for family pernment visa on MOI web site paid the visa fee. but there shown on (Your application cannot be processed .Because Istiqdam e-service business rules have not been covered). • Your application cannot be processed .Because Istiqdam e-service business rules have not been covered. Few of professions are getting this error, In this "Computer Programmer" is one. Reasons not yet known, I request you to go through manual procedure through Istiqdam (not online). Yes, Now its open for more professions, And error messages are in detail. Did you get a successful application for computer programmer profession? Salam, I have already paid the amount, but unable to start the application. There is an error " Your sponsor is not added to Istakdam visa application you need to visit Istakdaam office" I went to Istakdam office and called MOI but they have no idea, have any one face the same issue ? Any solution? Ask your sponsor, Or go through manual procedure instead of online. I went to Istakdam office and as per Istakdam Officer, Most of the profession are not yet added in system and this is the reason of this error, and you need to apply manually and you will get it easily. For now it is not allowing, But in coming days it will surely allow, "Computer programmer" is really good profession, your professions should be same as you work. However you can apply manually for permanent family visa. How can we get an appointment to apply manually. Iam trying since a week every 2 3 minute all the day but no appointment available. As per users experience, Its easy available on Sunday 7.30 AM to 8.30 Am, How ever i request you to keep checking again and again. need original certificate for family visa ? Apply online application, And check whether it asks you to visit istiqdam or it will allow you to submit online. If it allows you online, then no need of certificates. now they have added computer programmer in there list. Thank you for the great information. I just want to know if I apply online and get confirmation SMS and also the cofirmation on MOI website. As you said that we can send this confimation home for visa stamping. But in this case what will happen to the documents like company letter, translated and attested degree, then attested and translated marriage certficate that was supposed to be presented to the istiqdam officer while applying for family visa? We dont need it anywhere? For online permanent family visa it is not requiring for everyone, But for few professions they will ask to visit istiqdam with required documents. my Ikama profession is "Marketing Specialist"
can i get family visa with this profession? I am not sure on that. Yes dear, I have same profession and I met to ISTEQDAM manager. He told me "Marketing Specialist" is eligible to apply. But not yet covered under ISTEQDAM business rules. Shortly it will open for application. But don't have idea how long it will take. Dear Admin, did the condition of educational degree still exist or have been removed. As i knew from ISTEQDAM manager that "this condition will be no more effected". Is it ture ??. And why this condition is there to be live with your families?. Shariah asks for marriage contract to live with your wife not degrees or diplomas. My occupation is not according to my certificates. Because my line got changed according to situations in KSA. My company didn't haired me on my educational basis but my working skills. My salary is now 6,000+ , but because of this nonsense rule i can't keep my wife and children with me. We are living away from families for years and years. Isn't against the ISLAM and SHARIAH ??????????? If your online application is successful, then no need of certificates. Hello Experts, This is Mohammed Adil working as a Procurement Manager, but on my Iqama Professional has mentioned (Computer Network Technician) Can anyone let me know, If I will Apply by Istaqdam online service, is their chance to get the Visa & really appreciate to all of you for Proper Guidance. You can try yourself by logging into your MOI abshir account, And try to apply, Check whether it will allow you or it will give you some error with instructions to follow. Thanks for the Prompt reply, Can u Please let me know I am Eligible for the Same or not. Please try to check online by logging into MOI abshir account. can any body to help me, I filled up the ful name as in pasport but when i click the confirm tab. the error is " the names is in different language" can any body help me!!! Hello Experts, This is Mukul Kajwadkar working as Production Manager but on my iqama they mentioned (Production Mechanic Technician), Please let me know I am eligible for the Family Permanent Visa or not. Login to your MOI account and check if it is allowing you to apply online or not. What will be the validity for this visa I mean in how much time I should stamp the visa on the passport of my wife ? Because on the website of the mofa it is still written one year why I am asking about validity because I am planning to bring my wife right after hajj and I don't know whether after ramazan visa service will be open or closed. 1 year for stamping through embassy, 3 months for travel once stamped. i have mechanical technician in my iqama as profession but i have civil engineering degree completely attested from saudi embassy and saudi culture office, can i get family visa with this iqama profession and degree. You can proceed with online application, To know whether your profession requires documents or not for applying permanent family visa. Your Chamber Of Commerce (COC) is where your sponsor is registered. Your sponsor may have separate account for MOI to confirm your application. As of now, No need to submit documents or anything, if you do online. MOI is approving applications same day or next day by sending approved SMS. So it means that if they did not send any sms message it seems that my visa application was not approved? approved or disapproved they will send sms to me? You can check your status by logging to your MOI abshir account. SMS will come after approved from COC. Thank you so much for the information... I really appreciate it..
May be you paid under another service. Q1. If dependent name having only to fill 2 boxes, the remaining 2 boxes what can we mention? Q2. And the last 2 boxes can we put husband name? my wife name as AZIZA THABASSUM in her passport. My name as BABAJAN PASUPULETI. To fill the 4 fields in MOI application submission can I try like as AZIZA THABASSUM BABAJAN PASUPULRTI (or) AZIZA THABASSUM PASUPULETI "." (or) AZIZA THA BA SSUM. I will be thank full for your prompt response. My Employer paid the fees and I have successfully submited the application for permanent Family Visa online on MOI website. So the next step is to sign the application by Emploer and COC. Once its signed by Employer and COC. What should I do to the signed Application form?? Shall I have to submit it Istiqdam office or what?? Once its approved from COC, You will get SMS about your visa details. Then you can take print out from MOI account. My profession is "General Electrition" in my Iqama. Can i get a family visa from online...? Dear Sidhan, I request you to go to your MOI Abshir account and try apply for permanent family visa application, If the application allows you, then you are eligible. My Profession is "General Electrition" in my Iqama. This profession is eligible for family visa...? I have submitted the SADAD visa fees but still it says you haven't submitted the visa fees why ? I am working ministry of health as staff nurse, I have taken visit visa for mother in law and father in law but mistakenly it was wrote Down mother and father visa is issued but written as mother and father kindly give suggestion whether there will be any problem for them to come in this visa. Whether i need to cancel this visa. Don't put any dots"." because system will not accept. use all fields with your dependent name and your name as passport. You have to put a hyphen or dash. That is "-"
Please do NOT put dots!!! Thank you for your wonderfully informative article. I was able to successfully submit my application today. However, if you could clarify a couple of things it would be very helpful. 1) How long after the CoC attestation does the MOI usually send an approval/rejection SMS? 2) You have mentioned that all "formalities" must be completed within 30 days of submitting the application. What are these "formalities"? I was under the impression that once the application is attested, we just have to wait for MOI's SMS? Is there something else that we need to do? Like submitting any documents to the Istiqdam? Once again, thank you for your incredibly helpful article. I would like to know the list of relationships allowed on this portal. I am looking to apply for my mother, father and unmarried sister. I would like to know the relationship offered by this portal. As i am looking to apply for my Mother, Father and Unmarried sister. When I was applying I saw only three relationships in the drop down menu. Wife, son and daughter. My IQAMA profession is "Marketing Specialist" while i am receiving a message ("Your application cannot be processed; because it does not fulfill Istiqdam e-service business rules." You can book an appointment with Istiqdam and submit your occupation to be studied manually. To Book an appointment, please click here (Istiqdam appointments system)) when i am try to apply family Visa. Dear Brother, I already got Permanent Visa Allhamdulilah, please let me know how many months do we have validity of visa before endorsement and after endorsement. dear please could we talk on phone to discuss in details. Dear Friends, I have applied for online permanent family visa. i attested the same form by chamber of commerce. the status of my application is as"approved" with one visa no which is follow up no. i did not receive any message until now since i applied on 7th of April. please does anybody know what is the next procedure now. some blogs said now request will be reviewed by MOFA and they will make the visa as online. is it true ?? please help and if could call on 0531387288 it would be great. the status of my application is as"approved" with one visa no which is follow up no. I received approved message from MOI. please does anybody know what is the next procedure now. the status of my application is as"approved" with one visa no which is follow up no. I received approved message and visa no from MOI.